One of the world’s most iconic gold bullion coins, the Australian Gold Nugget is one of the most collectable items of annually released gold products. With a vast array of weights, special editions and designs to choose from, it has been designed from the beginning with the coins aesthetics in mind. By 1980, the South African Krugerrand made up over 90% of the entire world’s gold bullion market. Its dominance was such that governments had largely refrained from competing, that is until the late 1970s, with the introduction of several government minted coins, such as the Canadian maple Leaf. Australia released its own gold bullion coin, The Australian Nugget, in 1986, and it was instantly a hit with collectors due to the coin’s uniqueness and high collectability. Unlike most gold bullion coins, The Nugget was designed with a focus on aesthetics. Most coins of the era were minimalist, with the exception of limited edition releases to mark special occasions. The Nugget presented gold bullion with two toned and frosted effects that were unlike any other bullion coins on the market. They were also produced with a special hard plastic coating, that not only protected the coin from damage, it also gave the Nugget a unique sheen that remains iconic to this day. In the coin’s early years, the inverse depicted actual gold nuggets of various shapes and sizes, but after some complaints about the engraving (particularly its vague relation to Australia itself) the design was changed to a kangaroo. The coins are sometimes referred to as “Gold Kangaroos”. 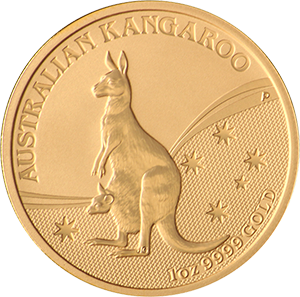 The design of the kangaroo itself is changed each year, increasing the value of the coins due to their collectability. The obverse of the coin depicts the figurehead of Queen Elizabeth II, which was designed by the word renowned Ian Bank-Broadley. The coin’s edging is milled, which is standard for most gold bullion coins in the modern era. The 2oz, 10oz and 1kg were released in 1991 after the smaller nominations proved to be highly popular. Unlike the smaller nominations, these larger coin’s designs remain the same every year and are affectionately known as “Red Kangaroos”. The Australian Nugget is one of the purest gold bullion coins in the world. This high level of purity ensures the coins value remains high, even against insecurity in the market. The fine gold content is 24 carats, which means the coin is made up of 0.9999% fine gold. Unlike some coins of this purity, which make the coin malleable and easily damaged, the Nugget’s hard plastic coating provides a higher degree of protection from wear and tear. The Australian Nugget is produced by the Government of Western Australia, also known as The Perth Mint. One of the most renowned mints in the world, The Perth Mint released the world record Australian Gold Nugget in 2011. Previously held by The Royal Canadian Mint, The Australian Nugget is an enormous 1 tonne fine gold coin. It has a diameter of 80cm and a thickness of 12cm. The coin was valued on release at A$53 and has a face value of A$1. As a collectors item, however, if it ever went to auction it is thought it might collect far beyond even this.